Human CD117, Fc Tag (CD7-H5255) is expressed from human 293 cells (HEK293). It contains AA Gln 26 - Thr 516 (Accession # P10721-2). The protein has a calculated MW of 81.9 kDa. The protein migrates as 100-125 kDa under reducing (R) condition (SDS-PAGE) due to glycosylation. 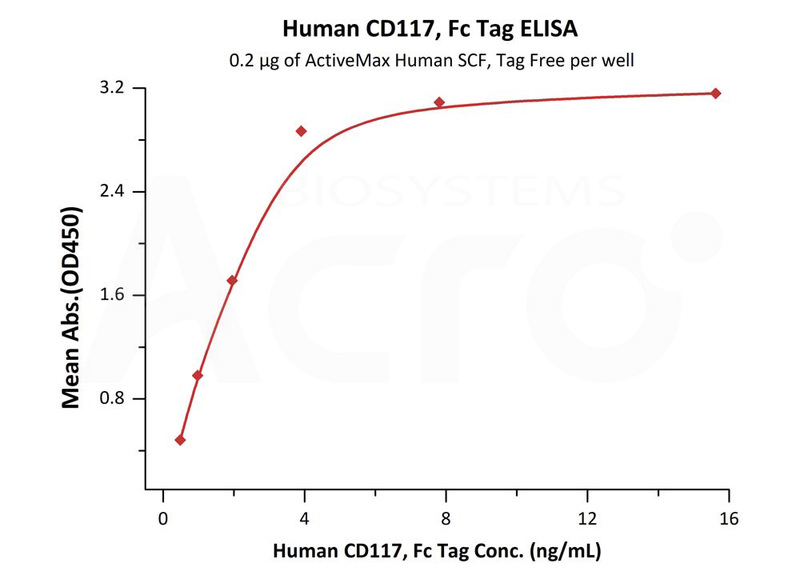 Human CD117, Fc Tag on SDS-PAGE under reducing (R) condition. The gel was stained overnight with Coomassie Blue. The purity of the protein is greater than 95%. Immobilized Human CD117, Fc Tag (Cat. No. 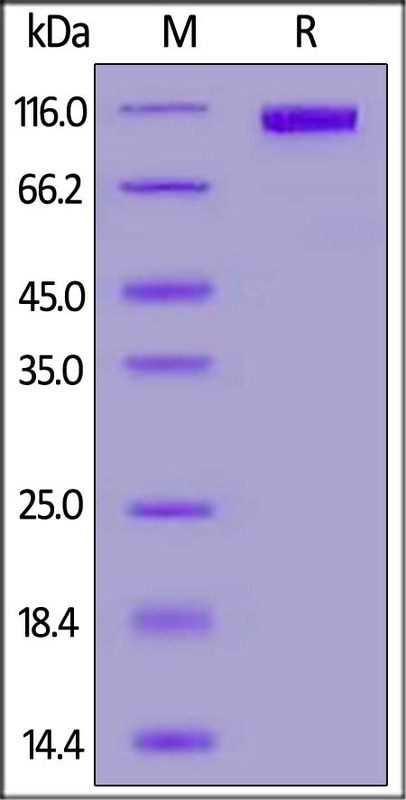 CD7-H5255) at 2 μg/mL (100 μl/well) can bind Mouse SCF, His Tag (Cat. No. SCF-M5228) with a linear range of 0.05-1.2 ng/mL (Routinely tested). Immobilized Human SCF, Tag Free (Cat. No. 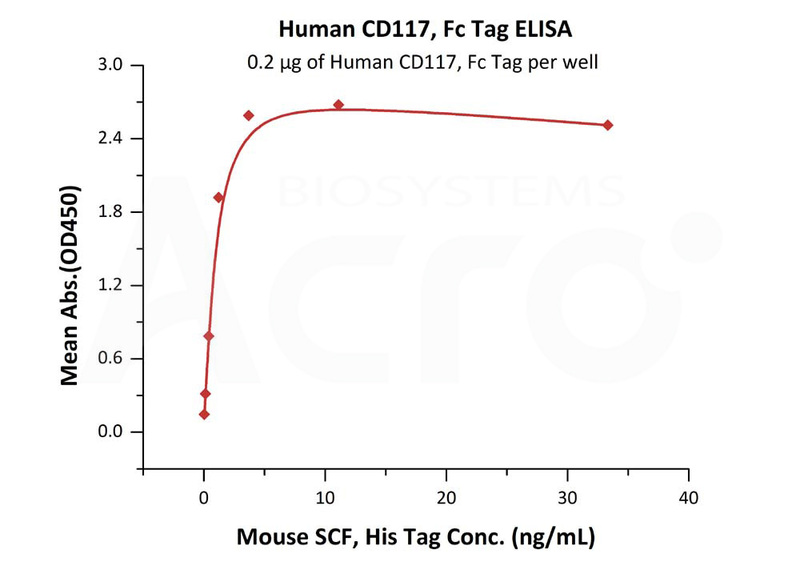 SCF-H4212) at 2 μg/mL (100 μL/well) can bind Human CD117, Fc Tag (Cat. No. CD7-H5255) with a linear range of 0.5-4 ng/mL (QC tested). Mast/stem cell growth factor receptor Kit (c-Kit), a member of the protein kinase superfamily, Tyr protein kinase family and CSF-1/PDGF receptor subfamily, is also known as piebald trait protein (PBT), p145 c-kit, tyrosine-protein kinase Kit and CD117,which contains five Ig-like C2-type (immunoglobulin-like) domains and one protein kinase domain. CD117 acts as cell-surface receptor for the cytokine KITLG/SCF and plays an essential role in the regulation of cell survival and proliferation, hematopoiesis, stem cell maintenance, gametogenesis, mast cell development, migration and function, and in melanogenesis. In response to KITLG/SCF binding, CD117 can activate several signaling pathways. Furthermore, Activated KIT promotes phosphorylation of the protein phosphatases PTPN6/SHP-1 and PTPRU, and of the transcription factors STAT1, STAT3, STAT5A and STAT5B. (1) Neumann I., et al., 2010, Pediatr. Blood Cancer 55:464-470. (2) Blume-Jensen P., et al., 1994, J. Biol. Chem. 269:21793-21802. (3) Sun J., et al.,2009, J. Biol. Chem. 284:11039-11047.